In 1994, BRAC, the world's largest NGO, made headlines by putting women's rights centre stage in Bangladesh, one of the poorest countries in the world. The Gender Quality Action Learning (GQAL) Programme was one of the very first large-scale efforts to mainstream gender equality and aimed to weave objectives of gender equality throughout its own microfinance, education and health services. 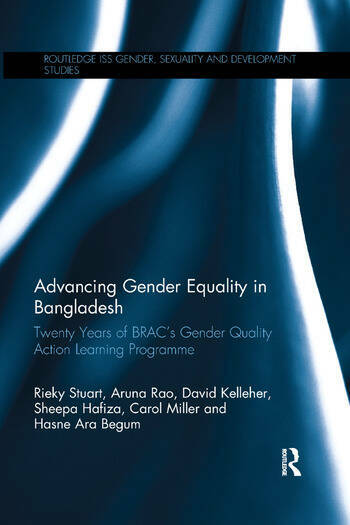 Advancing Gender Equality in Bangladesh describes the history, implementation, and outcome of this major 20-year initiative and discusses the lessons learnt throughout the fight to achieve gender equality outcomes in an effort to provide a tangible framework for future organizations interested in promoting gender equality and social inclusion. At a time when many gender equality programmes are still relatively young, this book offers a unique opportunity to track 20 years of intervention within a theoretical and cultural context and provides a platform for ongoing discussion about the roles of empowerment and gender transformation as agents for social change. This book provides an in-depth analysis of how strategies for change have operated in practice and will be of considerable interest to students, researchers and practitioners of international development, gender studies and social justice theory as well as those interested in a new practical methodology of the gender role framework.